Who could fail to have been inspired by the colourful spectacle of Danny Boyle’s opening ceremony for the London 2012 Olympics? 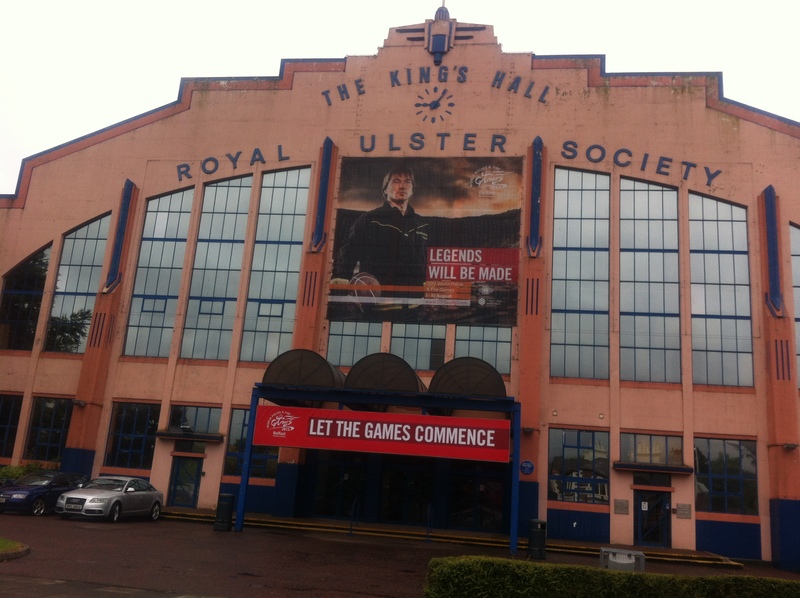 When the announcement that the 3rd largest sporting event in the World was coming to Belfast, and would have its own fabulous opening ceremony, I was intrigued. More than that, I wanted to be involved. And so I volunteered as a dance performer for the opening of the World Police and Fire Games 2013. There were very few people at the first meeting/ rehearsal which was held at T13, across the road from the iconic Titanic Belfast building. I hadn’t been to this venue before, but it is a great space full of BMX, roller bladders, scooters etc. And break dancers. I’d been a bit worried that the performance might be a gaggle of skinny 15 year olds twirling ribbons, but the dozen or so who were there were a variety of ages, shapes and sizes. Artistic Director Mags Byrne set out the theme for the parade and showed pictures of some of the costumes, played some of the music etc. She described one of the costumes as being like a big blue bird with wings, and suggested that it might have the most choreographical element – the other costumes and flag bearers weren’t doing much more than smiling and walking in formation. The smiling part was important, though, that was emphasised! 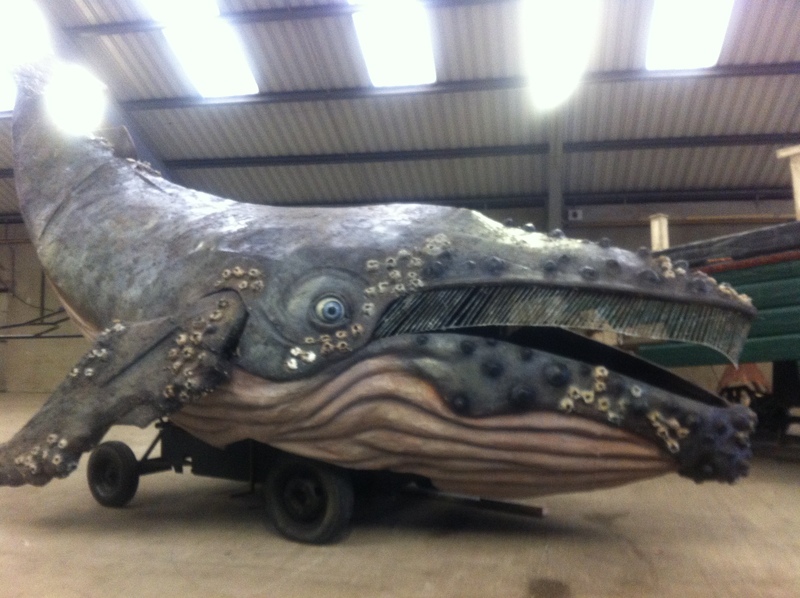 It’ll be outdoors, in daylight, so everything has to be really big, OTT, exaggerated. Subtlety won’t work. Back home, I asked my dance-student daughter if she’d come across Mags before, and sure enough, she had, as part of her performance with the Cultural Olympiad last year. There were lots more people around for this one! 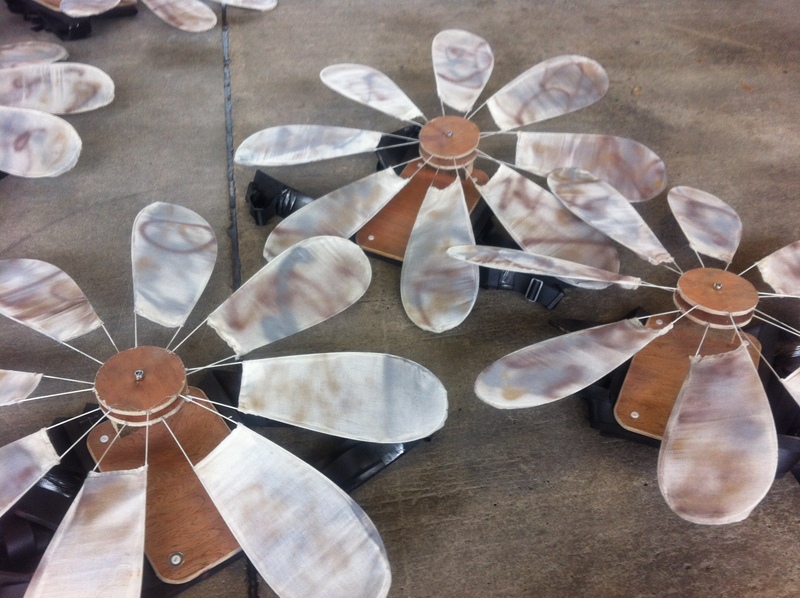 The various groups were shown their props and the moves they’d have to do – roly-poly arms for the propeller blades, dramatic avian moves for the black sinister birds, twirling white umbrellas for snow, and up-and-down black umbrellas for rain. There was not a lot to do for the big blue wings (now referred to as waves) but Mags did point out that your arms would get sore holding out those wings for a full 15 minutes. While smiling. But in my head I’d already volunteered to be in that group. Everyone picked their own section based on what appealed most – the propeller group was favoured by the blokes in the room. 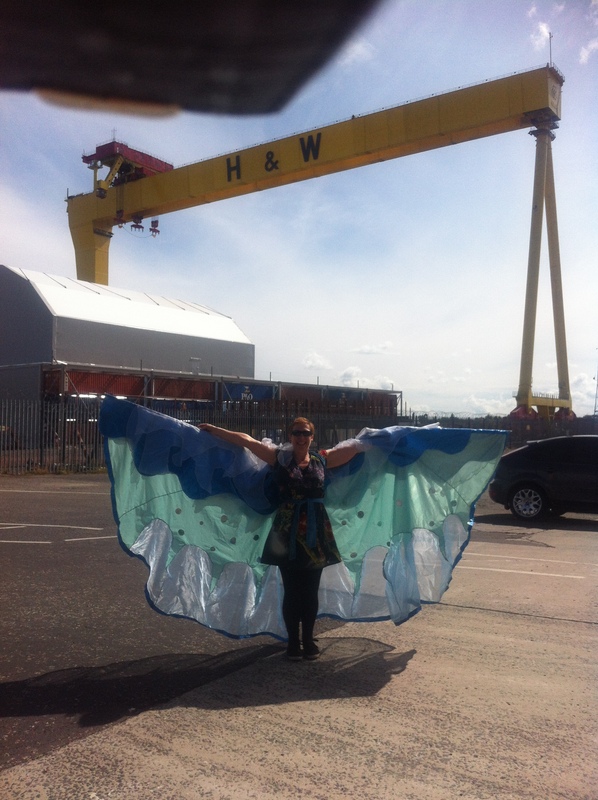 I joined my fellow wing/ wave dancers and we went outside to practise some moves, in the shadow of the famous Belfast Harland and Wolff cranes. 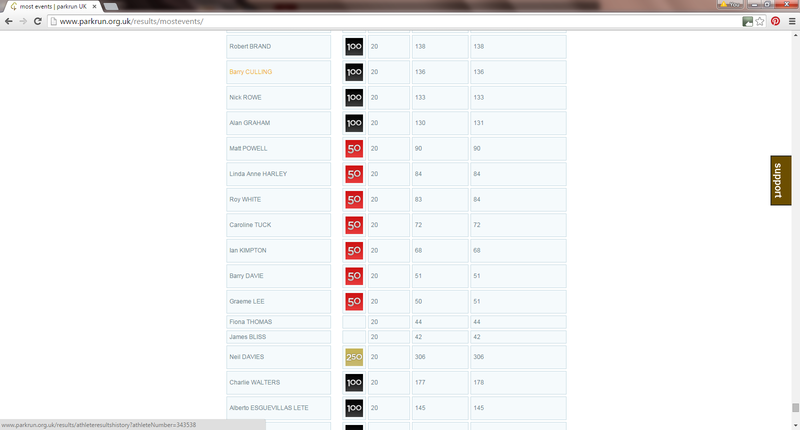 After a few minutes my arms were aching and I wondered if it was too late to change my mind about my chosen group. But the costumes were lovely – glittery sequin-strewn capes with poles to extend the arms, and fluttering in the breeze to represent the sea. Ah the sea! I grew up beside it and it has always been an important part of my life, so I reckoned I could “be the sea”. Yes Mags remembered my daughter fondly, when I asked her, and was very complimentary about her as a dancer. Our homework was to practise smiling for 15 minutes. There would be at least six TV cameras filming the event, to be shown in 70 countries around the world, so no doing anything that might be embarrassing, and keep expressions big and energetic. Oh dear, I bet my blue cape blows over my head and that’s the clip that’ll go viral…. I was really excited in the run up to performance day , full of adrenalin and positive nervous energy. I’d opted for public transport to the Kings Hall, and it was free for competitions and performers. Which was nice. I found my way to the allotted meeting point in Alexander Hall – the last time I’d been there it had been full of goats waiting to be judged at the Royal Ulster Agricultural Show! At 10 am, the hall really started to fill up: there was a group of young children who were to be a school of fish, the costume lady was dishing out the various jackets and headgears to be worn, and other performers were arriving and finding themselves a corner to claim. 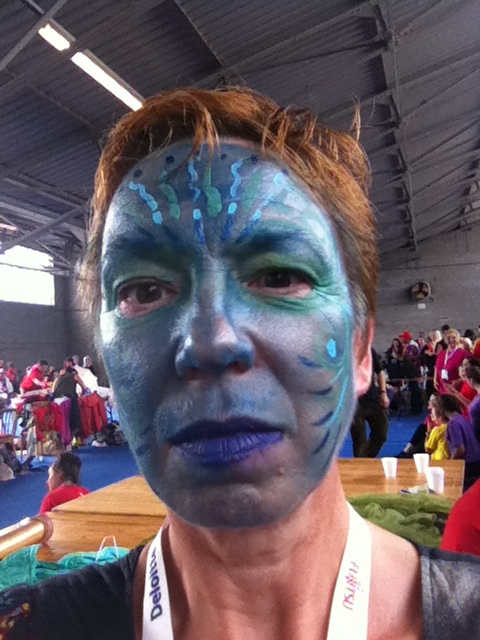 It transpired that there were different categories of participant – those with red passes were “volunteers”, and entitled to a £4 lunch voucher to be used at the various vendors on the site. They could choose from paella, pulled pork sandwich, or a gourmet hot dog. My meagre lilac pass marked me as a “performer” and consequently only entitled me to the sandwiches which were brought in in large boxes. I avoid bread, but I’d anticipated this problem and was well stocked with my own refreshments, including a rather tasty butternut squash and red onion tartlet that I’d made the night before. Outside, the rain had started. The forecast had not been promising, and there’d even been talk of tornados! I dreaded to think what my blue cape would do if caught by a strong wind. At 11 we donned some of our costumes and lined up outside in order, ready for the only practice run we’d have. The theme was “exploration”, and the opening music was the cue for some fur clad and ice-encrusted adventurers to appear from the small stage in the centre of the arena, and start looking round in an exploratory fashion. As the music rose in pace and tempo, they joined the head of the parade with a succession of floats. First came a small fishing boat. This was followed by a shipwreck, and, bizarrely, a piano. Then came a huge whale, complete with noisy spout, and in its wake chattered the school of fish. That was followed by a man with a spyglass in a bath tub, perched high on a scaffold. Then came my group of waves. The parade director decided that some of us waves should go in front of the bathtub, so that it looked more like it was surrounded. I was one of the four to go in this first group, which meant being circled and teased and deafened by the school kids who couldn’t resist playing hide-and-seek under our cloaks. We started our parade, smiling for all we were worth, twirling our capes as best we could in the drizzle and wind. Then, the music stopped. The whale was having difficulties in negotiating one of the corners, so we all had to go back and start again. The end product may all look very glamorous and be over in 10 minutes, but there are hours of hanging around in the rain for shows like this. Take 2, and we are more on top of what we had to do. As the parade proceeds, local singing star Peter Corry takes to the stage and sings about a little stream winding its way down to the sea. At this point the school of fish go off and do a swimming dance up the centre aisle, before joining the main parade again. The music returns to an up-tempo beat, and various BMX bikes appear and do some stunts around the centre stage. Peter comes back on stage to sing “Go the Distance”, which is our cue to leave by the nearest exit. Without cheering or whooping as we depart, so that audience is still focussed on the stage. Back in Alexander Hall, fine adjustments are made to costumes. Under our blue cloaks we wear rather fabulous green gowns, and mine needs to be shortened using a staple gun, so that I don’t risk tripping over it. It’s now lunchtime, and we have a few hours free to explore the site and stretch out legs. The rain has stopped and the sun is making an attempt to shine. While purchasing a coffee, I notice local DJ Alan Simpson sitting at a table, getting ready for his show to be broadcast from the venue later on. I introduce myself and thank him for his part in getting Jedward to sing Happy Birthday to my stepson last year. 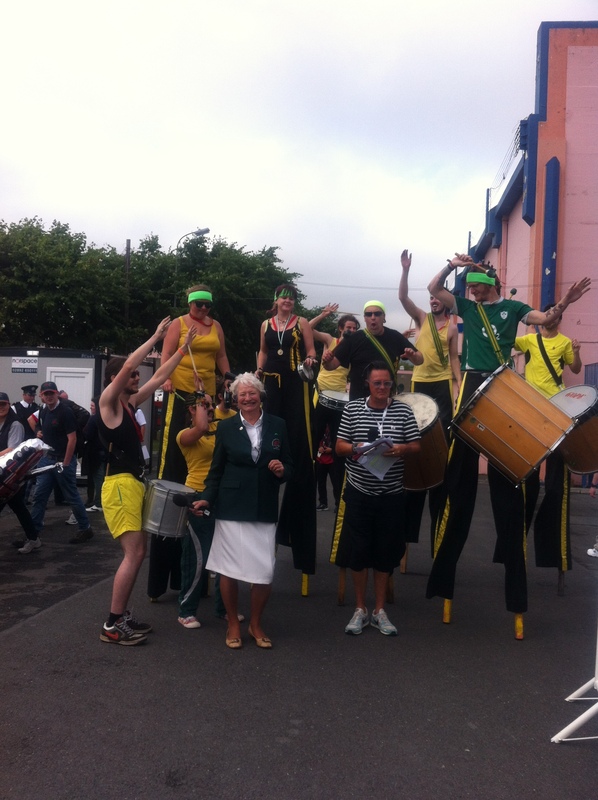 During his show, he chats with Olympic golden girl Dame Mary Peters, a wonderful ambassador for sport and for Northern Ireland, and the pair of them dance to a samba band who were wearing stilts – quite an achievement! The doors open to the public at 3, and soon there are long queues for the loos, the burger vans, the bar…. Tempting though it was to stay and watch the rest of the show, I really hate the rush of crowds at the end of events, so I made my way to the train station for the journey home, still in my blue face paint! This greatly amused some Sri Lankan cricketers who asked me to take their picture, especially when I discovered that I was on the wrong train! But I did make it safely home in time to watch the highlights on the evening news. It was a truly unforgettable experience. I am in awe of all those enthusiastic and highly trained athletes who will be here for the next 10 days pitting their skills in such events such as climbing-the-stairs-while-in-full-firefighter-kit. I am inspired by creative talents such as Mags and Anne Marie the costume guru who can work miracles with a staple-gun. And I love being part of a team of volunteers who are funny, warm, generous of spirit, and – as they say in these parts – great craic. I’m just about at the stage of enjoying fast days now – I look forward to them the day before, I have fun planning interesting menus, and I know enough strategies to help me cope with the hunger pangs. These are rare now – the odd rumbly tum, but it soon passes. 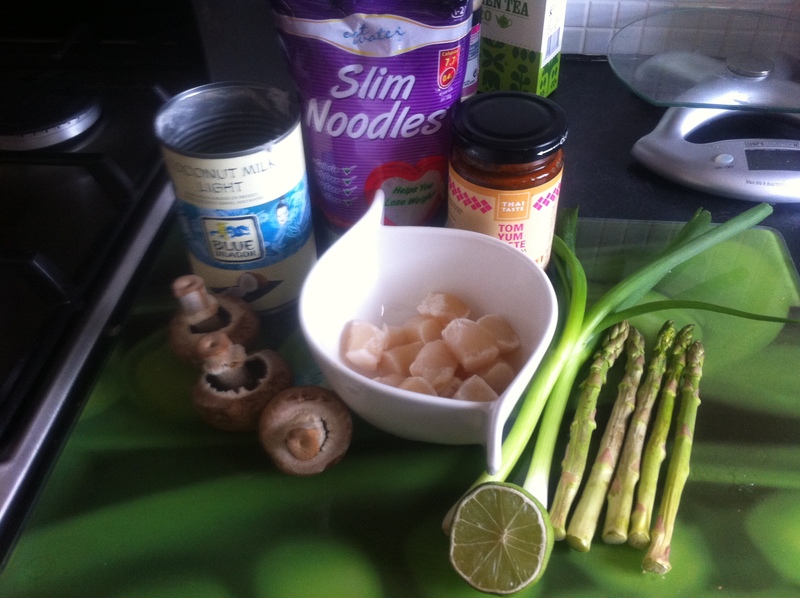 I’m having a “clear out the cupboards” kind of month, and some of the items I found lurking at the back of the freezer and fridge were a tin of light coconut milk, and half a bag of frozen scallops. 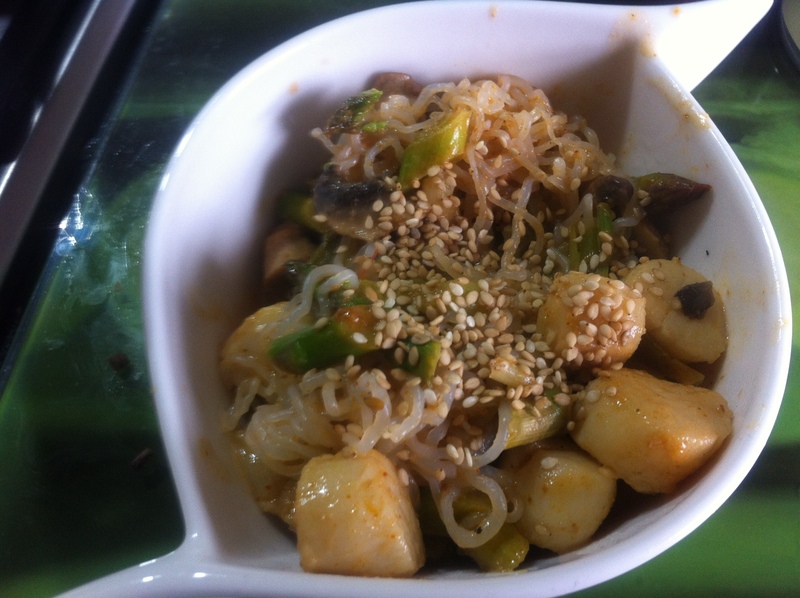 I also had some scallions, some zero/ miracle noodles, asparagus, mushrooms, and a jar of tom-yum paste. Dry fry them in a frying pan. 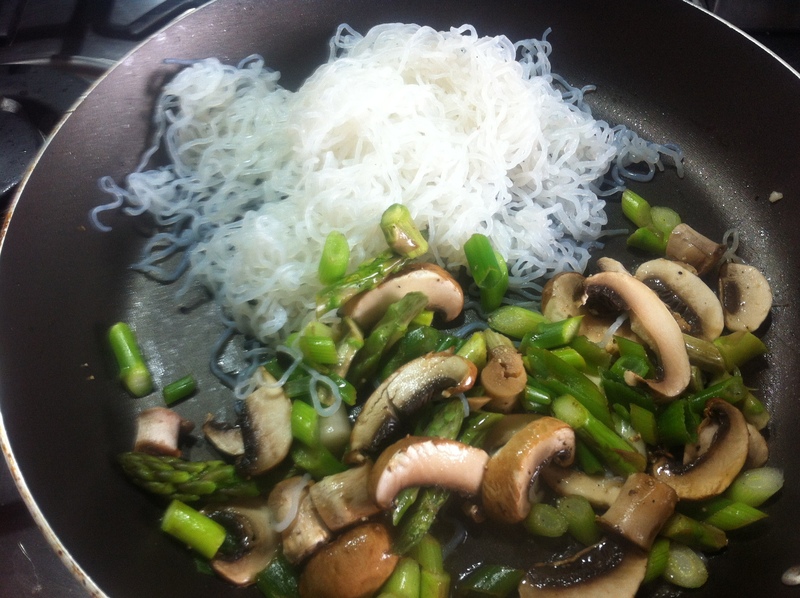 Move them to one side of the pan and add 3 sliced mushrooms, a few asparagus spears chopped into pieces, and 2 spring onions, sliced on the diagonal. (50 cals for the veg) Squeeze half a lime over them and cook for a few minutes until the veg are soft. Add half a pack of defrosted scallops (80 cals)to another part of the pan, and sear them on all sides for a couple of minutes. Should be around 280 cals for one very generous portion, done quickly in one pan. I’d definitely try this again – I forgot I had some lemongrass in a jar, which would have gone really well with those Thai inspired flavours. 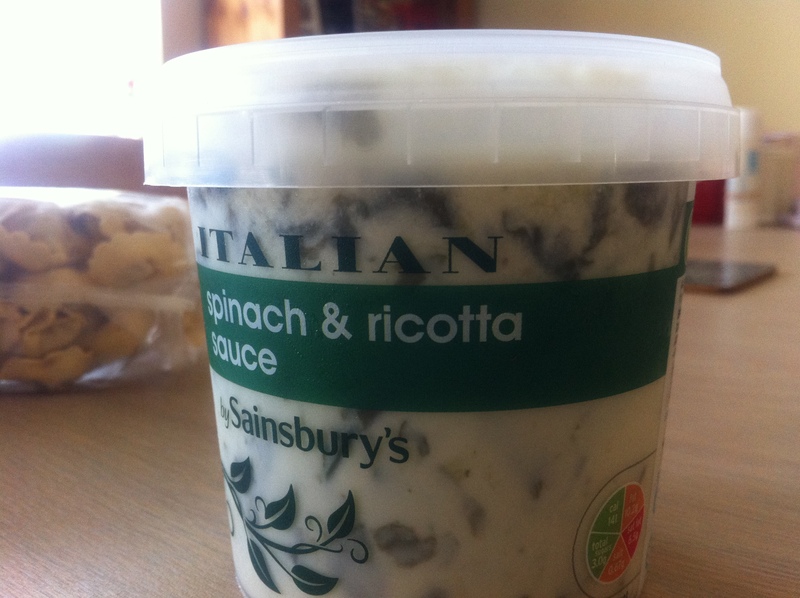 On Thursday, my husband was cooking, and he made the little vegetable rissotto kieves from Sainsburys. I experimented with baking aubergine slices without any oil. I sliced them into thick rounds, and laid them on a piece of kitchen roll. I rubbed some smoked paprika and some sea salt into each slice, and then arranged them on a baking sheet, lined with tinfoil. I cooked them at 200 degrees for 15-20 minutes, turning the slices half way through cooking. Aubergine is 26 calories for 100g, and a whole aubergine is around 300g. So say 75 cals for 7 or 8 good slices, which would do 2 as an accompaniement, or one hungry person on a Fast Day! I’ll be experimenting with these further too, very simple, the spongy flesh absorbs the spices, so it’ll be fun trying different flavour combinations. I only did one fast day last week, but as I’m so close to my target that’s OK. This was because on my usual fasting day of Thursday, I was instead taking part in the Opening Ceremony for the World Police and Fire Games! It was a fantastic day, and I’ll blog about it separately. One of the highlights was meeting Norn Irn’s Golden Girl, 1972 Olympic gold medal winner Dame Mary Peters. It’s hard to believe that this sprightly, smiling woman dancing to a samba band on stilits is in her 70s! She’s truly a testament to a healthy lifestyle – and to a positive mental attitude. This week I had 2 reasonably good fasts. I’d ended up witha glut of courgettes in the fridge at the weekend, so I turned them into a simple stew with a head of little gem lettuce, some spring onions, also nearing the end of their useful lives, and some good quality herb stock. 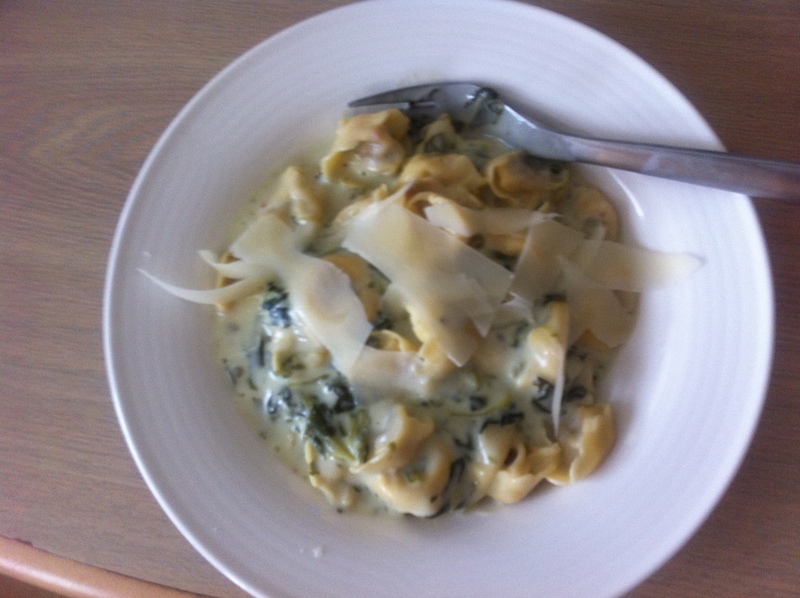 The resulting stew is ridiculously low in calories – about 20-30 for a cupful – and so when I returned from my zumba class and my husband had some leftover prawn ravioli and tomato sauce, I was able to add those to my courgettes and still come in under calorie budget. Wednesday’s fast was difficult – I felt really hungry to the point of nausea mid-morning, and had to eat a mini babybel and a packet of mini ryvitas to keep me sane. For dinner I had a whole tin of Baxter’s carrot and coriander soup for 150 cals – really tasty with a gingery kick to it. 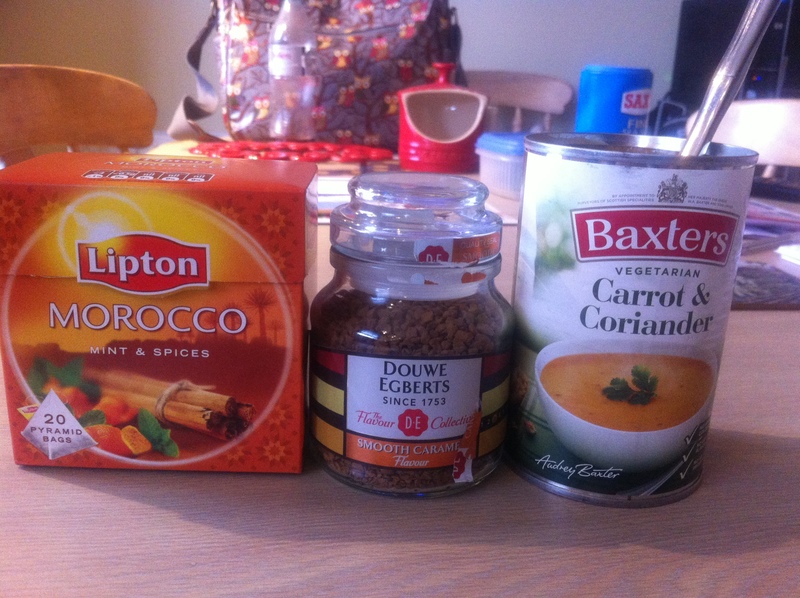 My other saviours that day were my caramel flavoured coffee, and some Morrocan spiced mint tea. Up till now, I’ve usually picked 2 days in the week that my husband and I are doing different things, so that we’re not necessarily eating together. But lately he’s expressed more of an interest in preparing meals that we can share, or that he can cook for me. Now, that tends to be based around ready meals, but there’s certainly plenty of good choices out there! 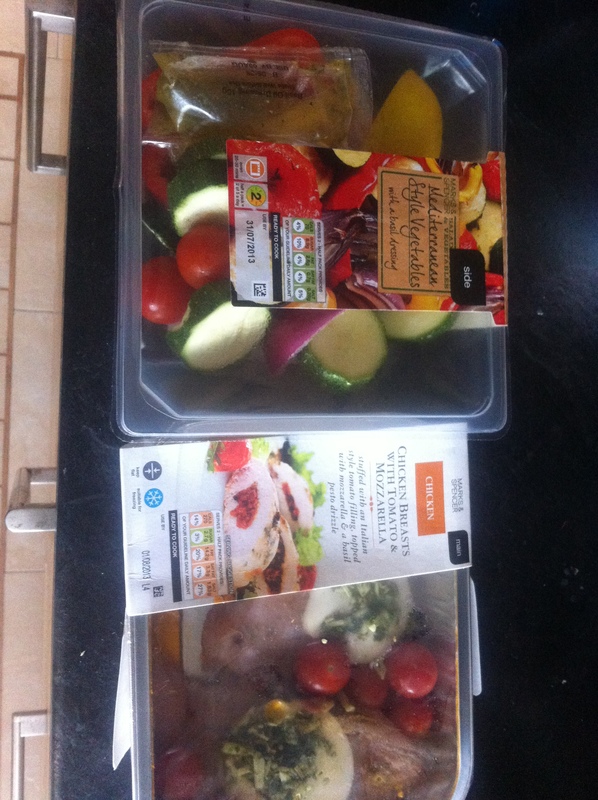 We even found that the chicken with mozzarella, accompanied by roast Mediterranean veg, part of the Marks and Spencer dine in for a tenner deal, would meet the criteria. Our first trials were the new Love Veg range from Sainsburys. 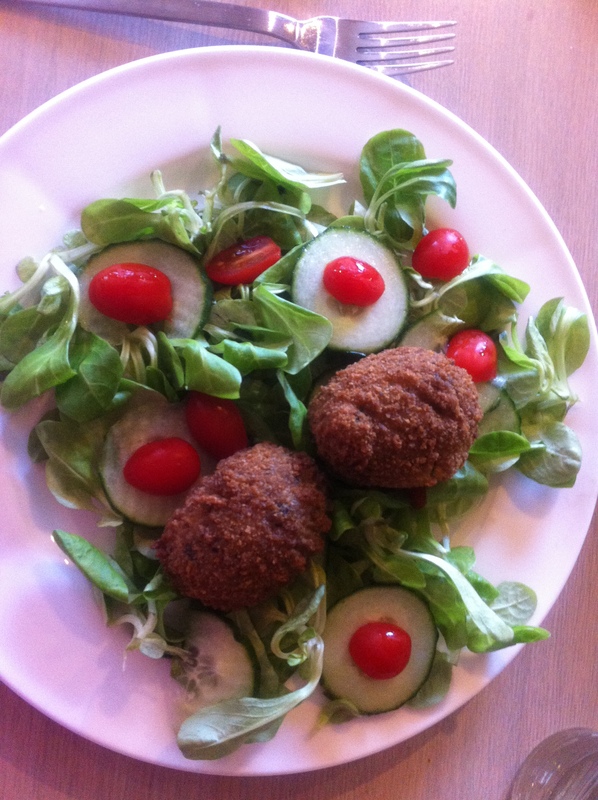 He had the green risotto kievs ready for me after zumba one night – I had them with some salad leaves, tomato and cucumber, while he had the more calorific accompaniments of coleslaw and pasta salad. They were absolutely delicious – I’d planned to have only 2 (they come in packs of 6 and are 116 calories apiece), but couldn’t resist having one more half. The other item from the range we tried was the spicy bean veggie burger. 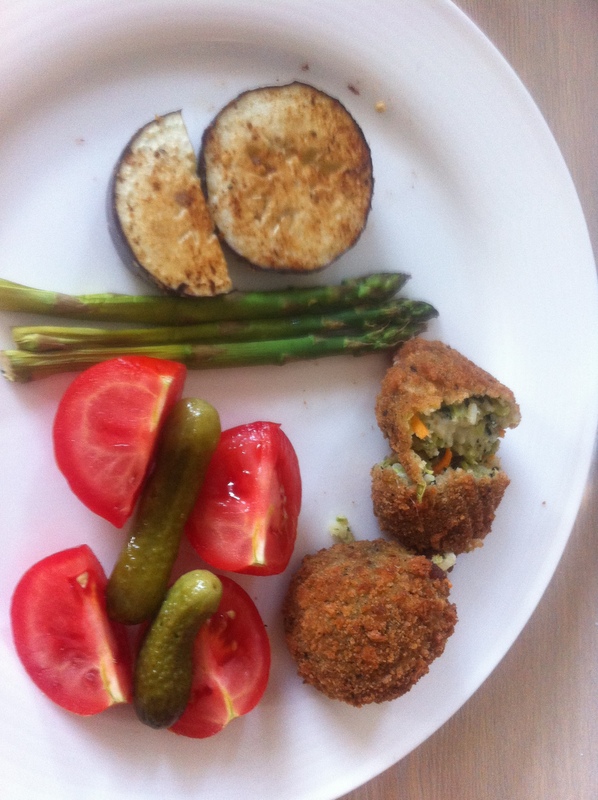 It was OK – I wouldn’t be rushing out to try it again, but it was a pretty tasty 250 cals. Pasta and sauce is a super-quick standby, but I often rule pasta off limits on fast days. 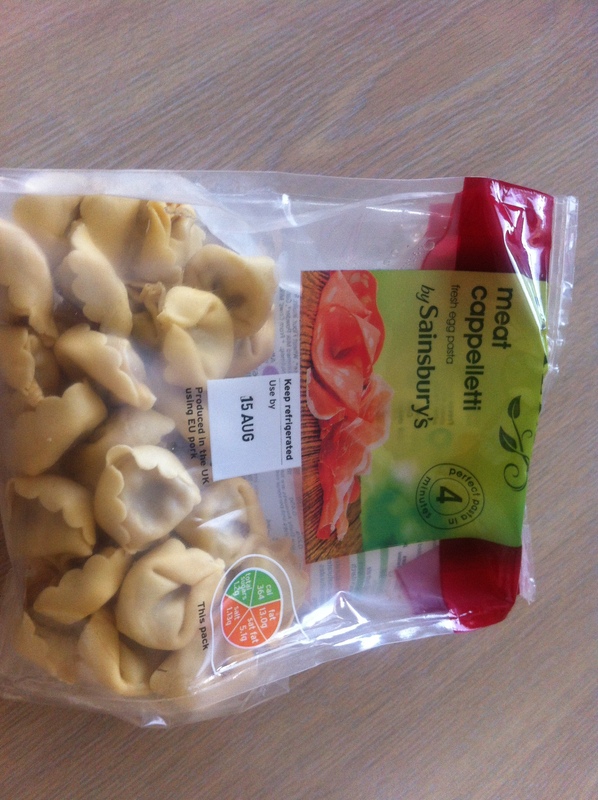 These little individual sized packs of cappelletti come in at 350 cals for the single serve, and when accompanied by a spinach and ricotta sauce at 100 cls for half the carton, can just about be squeezed into a fast day. Not really “stuff my DH cooks”, but he is terrible at buying bananas – cant bring himself to buy them singly, and so we often end up with over-ripe fruit, which I keep in the freezer for future use. Banana ice cream is ridiculously easy to make, and I find it a lovely post-run treat. 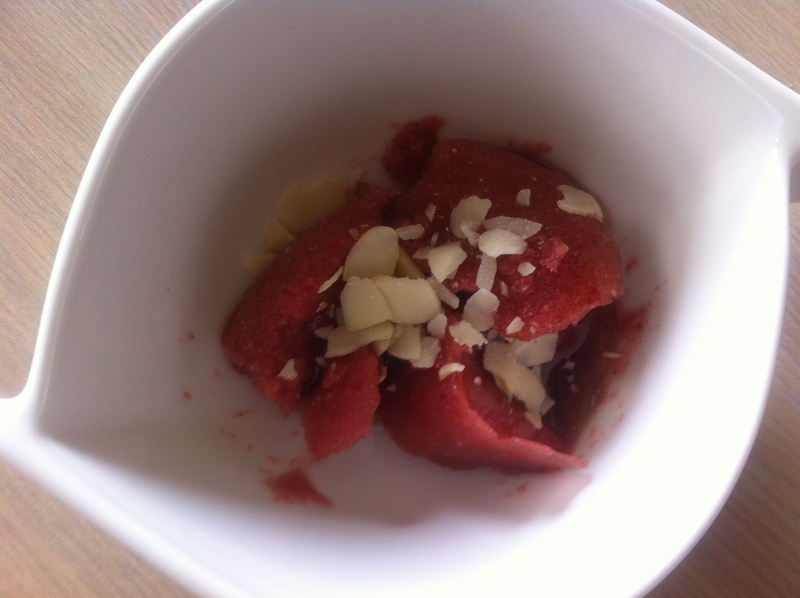 I also had some strawberries about to be too ripe to eat, so I mixed about 15 of them with 2 frozen bananas, blitzed the lot with a blender, adding a dash of Malibu and a drop of almond essence. Delicious served with a sprinkling of flaked almonds and a drizzle of balsamic glaze. What meals do you enjoy sharing with your family?